London has been in the spotlight a lot this year. Our sporting heroes have become household names and the royal family is as popular and as loved as they’ve ever been. But with all these wonderful celebrations going on, fashion has had to take a step back. 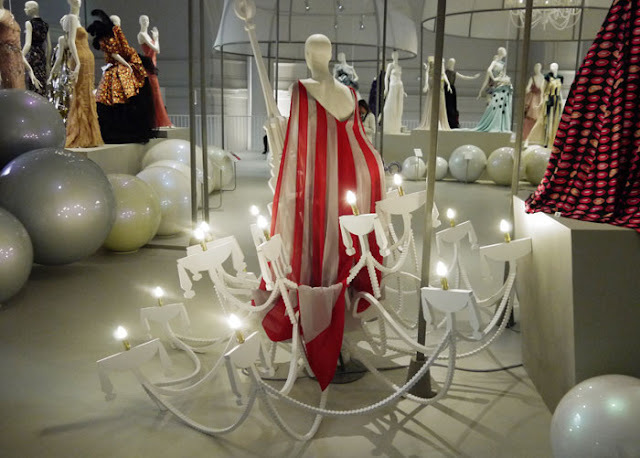 Of course Stella McCartney did us proud designing the uniforms for the Olympics and Kate donned some undeniably British attire during the Queens jubilee, but overall fashion hasn’t taken centre stage in London this year. 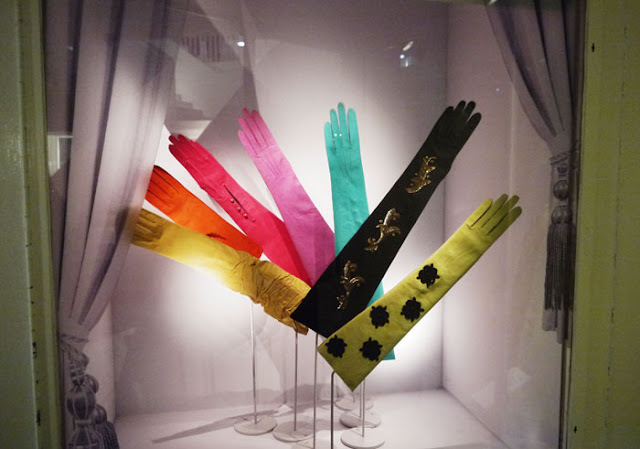 Thankfully the Victoria & Albert museum in South Kensington has paid tribute to British fashion design in the most fitting way. We’ve partied in frocks all summer, and we’ve seen princesses in evening gowns so it seems only right that the exhibition celebrates the very best of British glamour. Unfortunately I wasn’t allowed to take photos inside the exhibition but I’ve found some from the V&A website and from around the internet so you can see just how beautiful it is. The exhibition costs just £10 for adults and £7 for students but I couldn’t resist treating myself to a year long V&A membership. The museum is practically my second home and I didn’t mind paying the £48 to enjoy it all year. It gives me so much in the way of inspiration so it felt good to put something back into it. The membership entitles me to free entry into all the exhibitions as many times as I want, along with a guest of my choice. I also enjoy the benefit of membership only preview days, the V&A magazine and exclusive events- including talks from designers! There is even a members room to enjoy some lunch without getting caught up in the crowds. For just £48 I was able to take my sister and I into three exhibitions without any extra costs (It would have normally cost £7 each per exhibition) and I’ve still got the rest of the year left to use it! 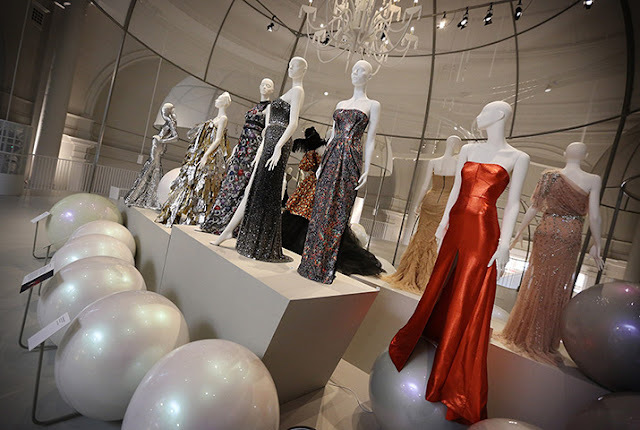 It also means I can go into the Ballgowns exhibition as many times as I want, to sketch, to admire, or to just sit and dream. I’d recommend the membership to anyone who lives in London as you save money in the long run and enjoy so many benefits – it would also make the most wonderful gift! Click here for more information on memberships. 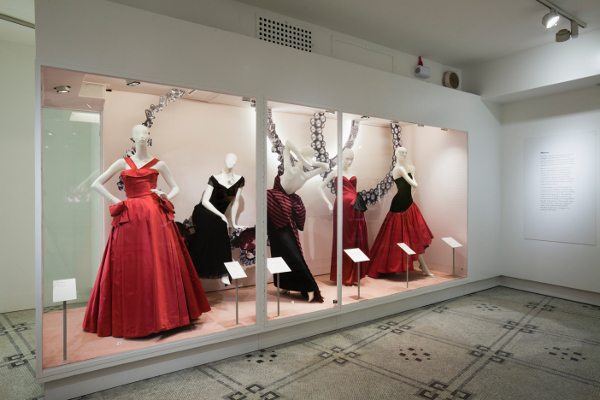 The exhibition itself is held in the newly restored fashion galleries that provides the most elegant backdrop for the gowns. The mezzanine floor houses a collection of modern dresses as where the downstairs exhibits gowns closer to the 1950’s. 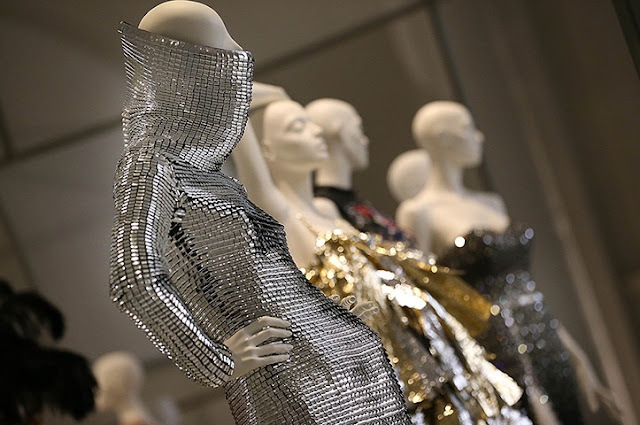 I began the exhibition downstairs and I quickly became mesmerised by all the chic, glamorous evening wear that was on show. 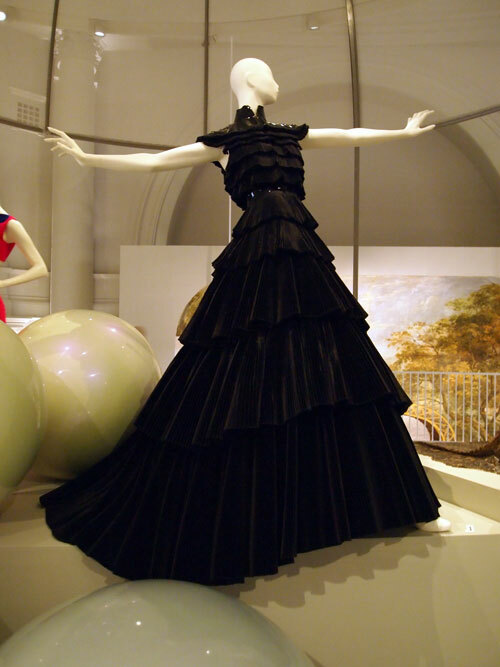 This included couture gowns commissioned for royal occasions and one notable dress that was worn by Princess Diana. 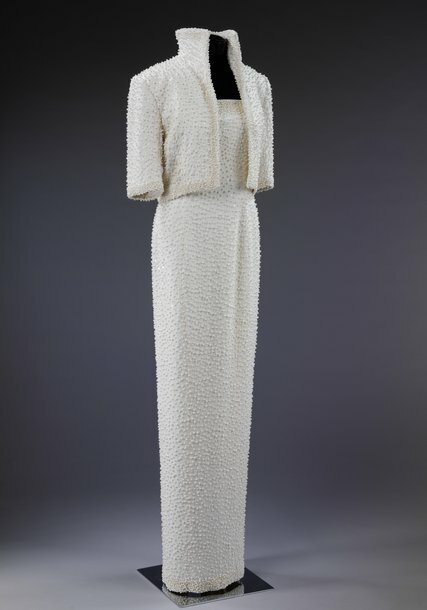 The iconic ‘Elvis dress’ designed by Catherine Walker is adorned with white pearls and a turned up collar. It is just as splendid in person as it is in the famous pictures, although Princess Di made it sparkle in a way that no designer could ever replicate. 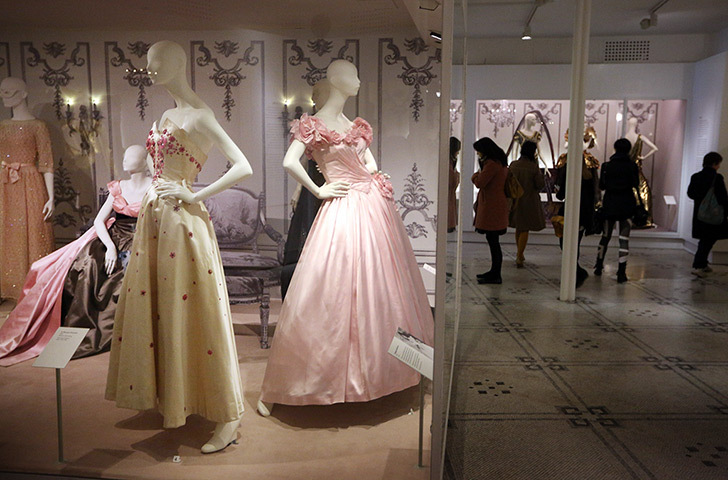 David Emmanuelle, the designer of Princess Diana’s wedding dress was also represented throughout the exhibition with several dresses including one very pretty pink taffeta dress that was designed for Joan Collins in 1983. The craftsmanship was outstanding, with fine embroidery, delicate lace and quality fabrics. The exhibition shows the changes in society, taste and class with couture becoming popular amongst celebrities and not confined to the debutantes who wished to display their wealth. Downstairs evening gloves, kitten heels and charming purses are displayed, expressing the formalities of the age. I made my way up the Hollywood inspired sweeping staircase to the more modern part of the exhibition. 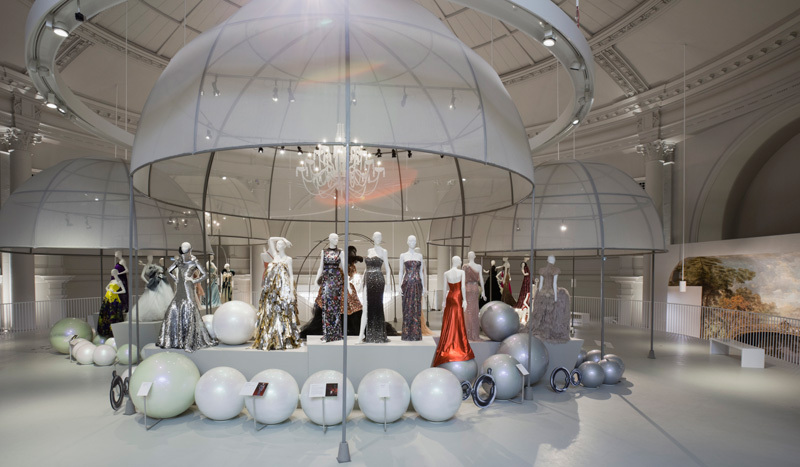 I was instantly immersed into the world of contemporary couture by the elegant chandeliers, revolving mannequins and stunning photos of the dresses projected onto the magnificent architecture surrounding the mezzanine. The sheer contrast between the contemporary numbers and the full-skirted 50’s frocks shows just how much society has changed, how the industry has developed, and how much more freedom designers have to push boundaries. The upstairs level is a dazzling celebration of design, imagination and British intuition. The collection includes dresses by Vivienne Westwood, Alexander McQueen, Zandra Rhodes, Gareth Pugh and Ralph & Russo. 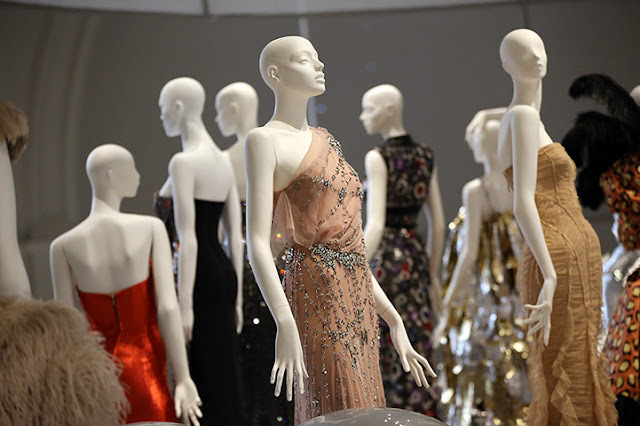 Whilst the majority of the downstairs gowns were commissioned for the likes of Queen Elizabeth the Queen Mother the dresses upstairs were designed and worn by celebrities including Elizabeth Hurley, Beyonce and Sandra Bullock. 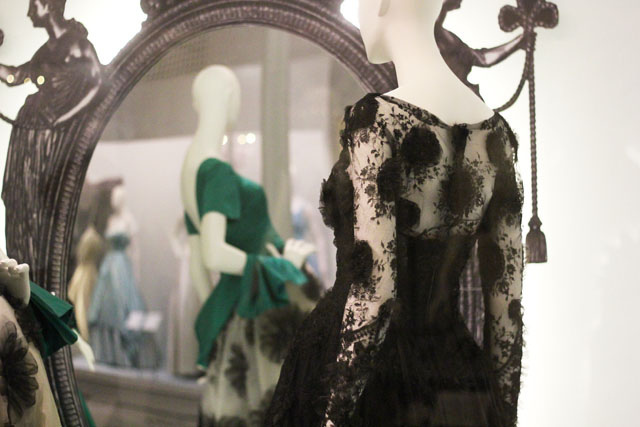 Here are some of my favourite gowns from the exhibition. 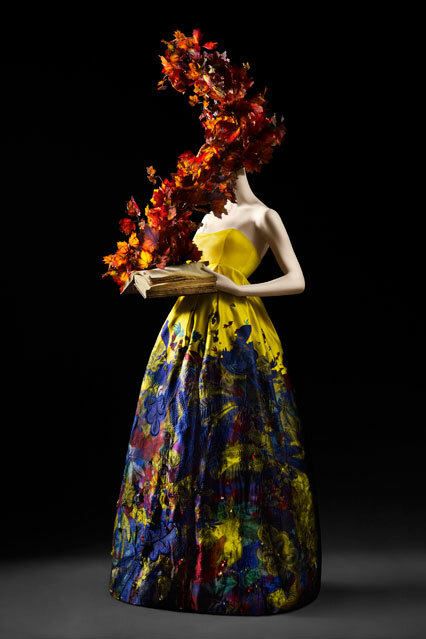 Here is a video for the exhibition featuring interviews with Bruce Oldfield, Nicholas Oakwell, David Sassoon, Mary Katrantzou and Roksanda Ilincic – definitely worth a watch! The museum shop is selling an accompanying book that I hope to buy very soon. I’ll post a review of it along with some scanned photos as soon as I do. The exhibition is showing until the 6th of January 2013. 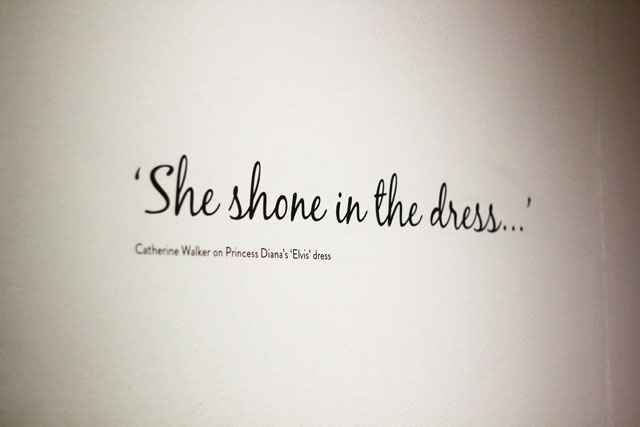 Click here for more information on the exhibition or to book your tickets. 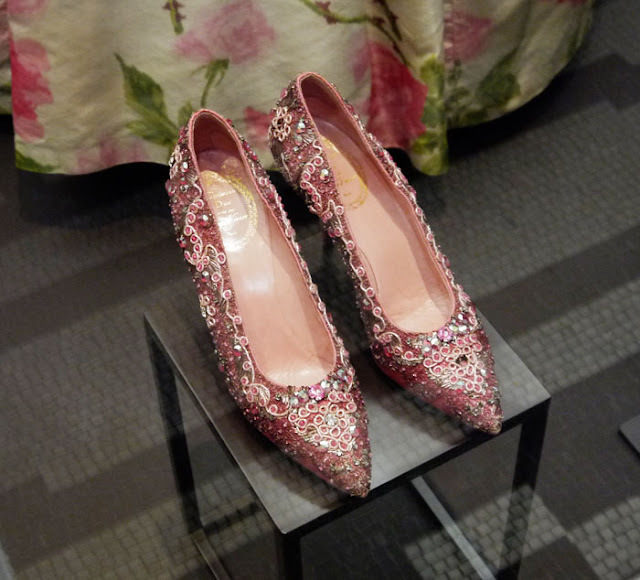 Previous Post Christian Louboutin Exhibition at The Design museum, London. I am so excited about seeing this! I got an Art Pass instead. I get half price entry, not free, but it applies to almost every museum/ art gallery in the UK so it was a better deal for me. great post! love all the photos. 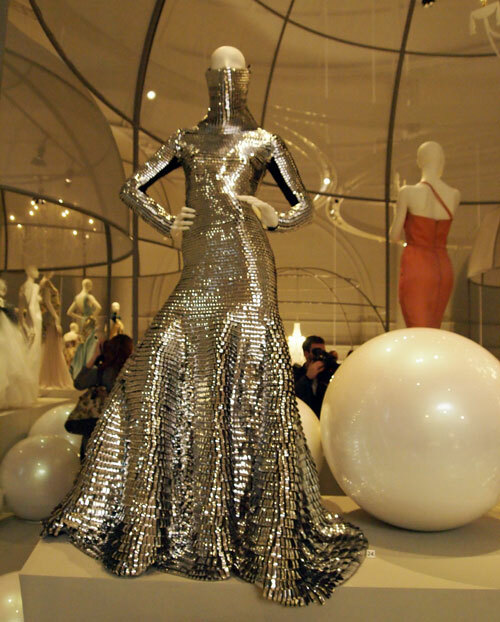 victoria and albert museum is one of my favs. I can't wait to go see this, I've been planning for a while but it's open til January so I'll go when I can. I live in the outskirts of London so do go every so often, and I think when I graduate I'm gonna treat myself to an all year pass. I'd love to be able to take my boyfriend with me for free cos he always pays to come into them with me haha! Gorgeous gowns =) Thanks so much for sharing… I'm your newest follower via google! I'd love for you to come check out my blog and maybe follow as well? Hi Thanks for visiting me. I am following you on GFC and bloglovin now. But I am sorry I cant see you on my follower list. Can you re-follow. Lovely collection. Wish I was able to visit this museum. So inspiring ! Nice post btw (: Can we follow ? Stop by soon love . I wish someday I can visit London. London is one of my dreams! 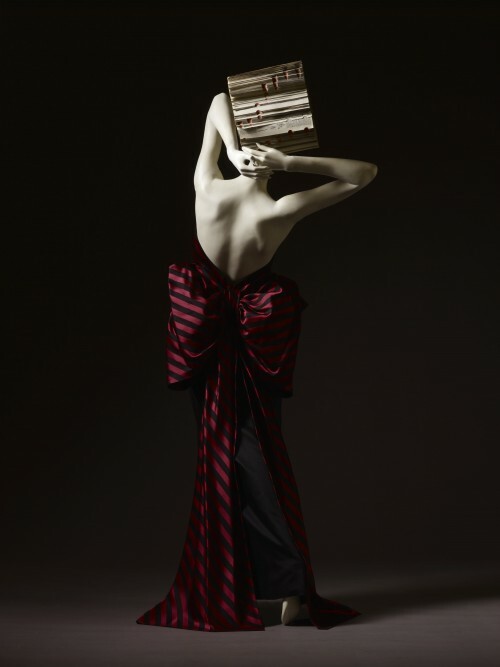 come to my blog anytime..
All of these garments are just incredible. I'd love to see this exhibit myself! so much inspiration….now I'm following you.thanks. You have an amazing and beautiful blog, everything is so well done and your posts are so inspiring. Gladly followed through GFC, Bloglovin (for both of your blogs) and liked you page in Facebook. Have a great day, Jenna! Hi Jenna,thanks for your comment. Your blog is realy nice! in btw thanks for your comments 🙂 and to your question: I would say no! But I have to say that I often walk in heels so it's not a real challenge for me. ball of your feet (like in normal heels). yes, we've all been on such a British kick in the last year! very true. wow- this museum is breathtaking. I would LOVE to visit. How exquisite. These dresses are so beautiful! Great post! Thank you for comment and following my blog. Wow! I'd like to go to this museum! Those dresses are so creative…love how brave the designs are… but oh my, how did that lady get into the lace print on latex dress??! I want to go to London this weekend and this looks like a great thing to go check out, but unfortunately I'm going with the wrong people to look at pretty dresses, but maybe some other time. Thanks for the info about tickets, and great photos! Wow! I seriously wish I could check out that exhibit! Looks incredible! Oh thanks ! Great blog and amazing photos ! 🙂 I follow you 🙂 Kiss from Poland ! thank you for following. 🙂 we are followin you back. So many amazing dresses, as well as amazing photographs!! 😀 Thank you for sharing this with us! Loveee your blog, great post! Wow this looks amazing -great pictures. The photos are incredible and the blog's is very cute!! Great pics!! Thank you for stopping by leaving a sweet comment and ofcourse following. I am following you back via GFC – 133!! !Let's stay in touch. Hey, Following you from Blogger. U appear on my reading list. Thanks for the visit. I really like your blog, maybe we could follow each other? I'd love to pay a visit to this place, wow! Thanks for the follow! You have a blog full of inspirations. 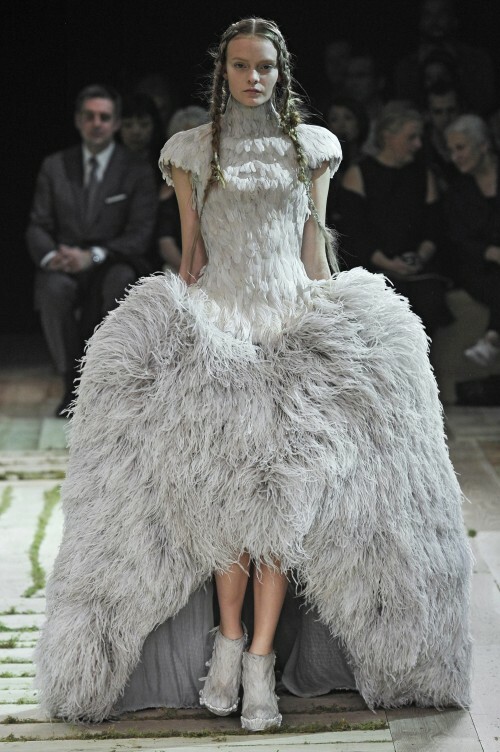 I just died and went to couture heaven. Great post and photos (especially that last photo!). those pictures show and proove perfectly why I love (not only british, but especially this one) fashion. I just love that. the pictures are wonderful and very inspiring !!! Wow, it is simply gorgeous!!!! & i falled in love in your header. Aw seems like you had a lovely day Jenna, we must meet soon! o m g super super nice place and collections! Wow this post just made my heart melt !!! Lovely blog i am definetly following you!! everything is so gorgeous… omg i want to go to this exhibition!! Oh my gosh, Jenna, you're such a darling for sharing this in such detail. I would have loved to see this exhibition in person, but since I'm on the other side of the globe, you allowed me to not miss out entirely. Amazing. Thank you! Wow some of those dresses are absolutely beautiful! I would have loved to have seen these! Thank you for following my blog!! This is huge for me =) I just started and I am always so grateful when there are some people who want to follow my blog! I lived in London in 2010 for six months and I couldn´t resist to go to the V&A Museum. I loved it! Would I live in London now, I would definitely get a year long membership. This post is great! And the pics are stunning. I hope one day, I can move to London or at least move to England, I love all about the country, the people, the history´and the like! In the beginning of the next year I have a 6months long internship and I do hope, I get a position in London! Best City EVER =) Sorry for talking so much about your country! Still, the post is great! I´m following back! And thanks again!! wish we had something like this over here! thanks for passing by my blog!! nice pics hope i could have one of those! sure we can follow each other!i am already following u!